The raised flatlid casket is very popular and you can make up to 100% profit on this product. Instead of using hardwood you can either use chipboard or supawood and stain it, or use MDF foil (chipboard that is already covered, similar to kitchen cupboards). 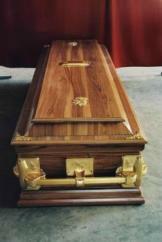 There is a huge demand for this casket and you need to practice until you get it right. Practice using cheap chipboard until you get it right. The manual will guide you through the entire manufacturing process.